Last, but not least in this DutchWare series is the Whoopie Hook. When Dutch first sent me a pair of these hooks to review for the illustration, I was confused on how to use them. This is because Dutch re-imagined how to use the familiar Whoopie Sling: instead of attaching the fixed eye to the hammock it is secured to the tree webbing. This means that the adjustable end of the Whoopie Sling is toward the hammock. Once I got straightened out, the concept works great. The Whoopie Hook is threaded into the adjustable end of the Whoopie Sling and does double duty as a stopper bead. The hammock must be configured with an end rope or continuous loop where the hook can attach. I should mention that the Whoopie Hook is designed to be used with 7/64″ Amsteel Blue line, both for the Whoopie Sling and for the loop that is attached to the hammock. Anything larger will not work. Smaller line, like Dynaglide, will work, but even with the larger Amsteel, be sure to inspect the line for abrasion before any hang. You can still use a marlin spike hitch instead of the square knot at the connection between the webbing and the whoopie. Yes, if you had long webbing. The way that DutchWare has designed the system (if you buy it with strap, sling, and hardware) is that the webbing is purposely short. Except for really small trees, the webbing rarely reaches the entire way around, so tying a Marlinspike Hitch isn’t possible. DutchWare also ships the Whoopie extra long, so the intent is that the Whoopie does the heavy lifting for adjustments. That said, if you just get the Whoopie Hook hardware, then you can manipulate the length of the sling and strap to your liking, providing an opportunity to tie a Marlinspike Hitch if you need/want. In my own experience, I like the shorter strap. With the Whoopie Sling attached directly to the strap via the Lark’s Head, it provides a very simple and adjustable system. Just another option in your quiver of hammock suspension techniques. I often switch between techniques so if one works better for you I support it. However, you do bring up an interesting argument about slippage I want to address. Whoopie Hooks use a different technique than a Marlinspike hitch and have no issues with slippage. The Marlinspike hitch relies on a toggle that the Amsteel is looped over, whereas the the Whoopie Hook is, well, a hook and actually clips to the Amsteel. Sliding the Amsteel back and forth on a Whoopie Hook while adjusting the sling or “whipping” the line up and down will not unhook the suspension. Conversely, similar activity on a Marlinspike hitch and toggle can make the Whoopie sling fall off the toggle entirely. Honestly, sometimes the Hook can be difficult to unclip, requiring a bit of a tug to release. I’ve found this more often when I wear gloves in the colder seasons. So, no real uncertainty of slippage whatsoever. The main issue with the Marlinspike hitch is making sure you tie it correctly, otherwise you can have slippage and end up dropping your hammock (ouch!). 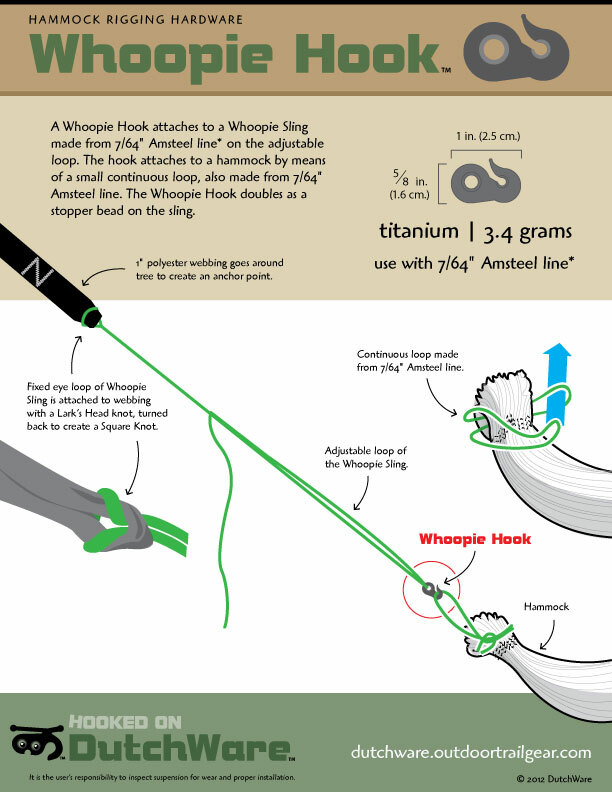 In a direct comparison of the Whoopie Hook and a Marlinspike Hitch method, the main advantages are: 1) no knot tying (important to some); 2) straightforward connection (no guessing about on/off the knot, if you know what I mean); 3) no slippage; and 4) lightweight. Lightweight can be argued, depending on strap length, hardware used, etc. Most folks who use the Marlinspike technique prefer a long strap that has a sewn eye loop on one end and a long running end. The long running end allows for lots of adjustability. Generally speaking, webbing strap weighs more than Amsteel, but much depends on strap material. If you leave the aluminum toggles, you can save 10 g (0.4 oz), getting you to 132 g (4.7 oz) with a basic Marlinspike Hitch kit. what about slippage on the non whoopie hook end? Whoopie Hooks are typically installed on 7/64″ Amsteel Whoopie Slings, which have an adjustable loop on one end and a fixed loop on the other. The fixed loop is most often attached to a length of webbing strap that has loops on both ends. The strap goes around the tree/anchor point and the adjustable end of the Whoopie Sling with the Whoopie Hook feeds through the free strap loop to “cinch up” around the tree. The fixed eye loop is not adjustable and will not slip. Derek, how would you feel about replacing the hook with a soft shackle out of Amsteel? Worse water drip point? Other pros/cons? Tord, I haven’t tested the soft shackle as a water break, so I’ll add that to my experiment list. If you are trying to remove the hardware device, it begs the question, “why?” (please note, I’m not opposed to eliminating the hardware, just asking) If you are trying to save weight, the difference is negligible if anything. Ease of use will diminish because soft shackles require a little more fiddling and dexterity. If you already have the Amsteel, than you’re really just saving money 🙂 which isn’t a bad thing. If you are using the set-up described in this post, I would also consider putting a toggle on the continuous loop on the hammock (with a Lark’s Head) and then slipping the Whoopie Sling loop over that toggle, like you would with a Marlinespike Hitch. You’d want the toggle to be strong and it could be wood found in a campsite. Derek, the reason I was asking was mainly that I`m going to try out splicing and figured that a soft shackle could replace the hook (which is not trivial to get a hold of from Sweden). Or in other words, finding different applications that can be solved by splicing projects 🙂 Just wanted to check first if the idea should be killed immediately. The Eye On Eye sling toggle does seem an even simpler solution, but less splice-funny, thanks for the tip. Your blog is a great inspiration! Thanks Tord. You’re a man after my own heart — DIY projects are fun, inspiring, and rewarding. Yes, the soft shackle should work just fine. Let me know how it goes! Any idea how using the hook reversed would work (fixed to the hammock end)? I have a set of dynaglide whoopies and extra amsteel, id like to use hooks but i wouldnt be able to install them on my current set of slings. You can put the Whoopie Hooks on either side of the equation; they work equally well. How do you stop the continuous loop larks head from slipping out of the hammock’s gathered end channel when there’s no weight on it? Mine keeps falling out and it’s a huge pain to get it back through again. I have the same concern. All references I can find to fixed loops at the hammock end show a larks head. Is a double pass through the hammock end necessary, or would a single length with ends joined in a grapevine bend (ABOK #294) work? This would prevent the fixed loop separating from the hammock. Also, how to get a whoopie hook on the spliced eye end of Amsteel? Would a larks head do the trick? If I follow you correctly, yes, you can splice a Whoopie Hook onto a continuous loop. That’s not difficult. From there, you can attach the loop through the end of a hammock either by a Lark’s Head in an end channel or by doing a whipped end.